James A. Bate was a prominent citizen of Chippewa County. He was secretary of the Union Lumber Company, graduate of the Harvard University School of Engineering, and elected to the Wisconsin State House of Representatives. He was secretary & bookkeeper to Warren Flint who operated a huge sawmill in the Town of Estella. He was appointed in 1870 and served through 1877 as the very first Fire Chief for the city of Chippewa Falls. 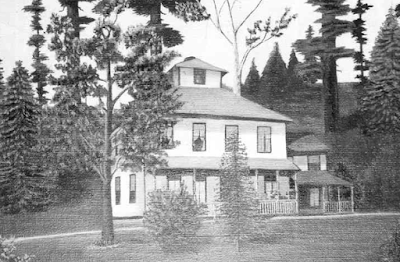 When the original Township of Anson was divided, James became the first clerk for the new Township of Arthur. He is buried near here at the Pine Grove Cemetery. (Note: Pine Grove Cemetery is located on County Highway S, ¾ mile west of Highway 27 on the north side of the road. A book authored by Mrs. Edward Porter of Cornell, WI called The March of Civilization has a photo of James A. Bate in it). The marker is located at Pine Grove Cemetery on westbound County Highway S, about 3/4 of a mile west of Wisconsin Highway 27, Cadott, Wisconsin 54727. This marker is No. 34 in a series of historical markers erected by the Chippewa County Historical Society. 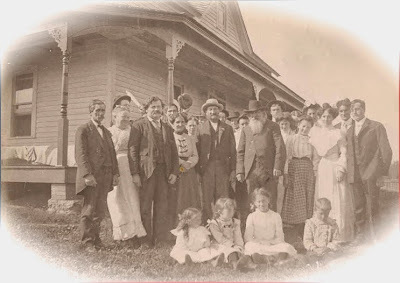 James A. Bate is in the center, with the hat and long white beard. Nearby barn . . . beautiful scenery! The marker is located at Pine Grove Cemetery. First visited September 2014, before the marker was erected . . . Nearby scenery . . .